Even though it’s not an era in which I have any academic expertise, I admire the Gilded/Edwardian era from afar: nearly every contemporary commercial image seems to convey a society that is simultaneously dynamic and elegant. Of course we never see who did all that ironing! 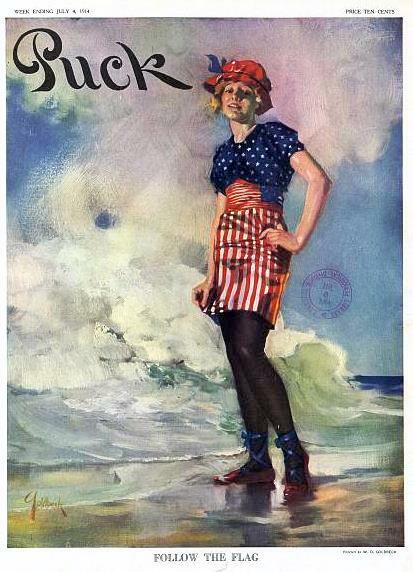 The other day I was looking through some examples of a new ephemeral category for me, menus, when I spotted a rather dashing young lady outfitted for the Fourth of July. 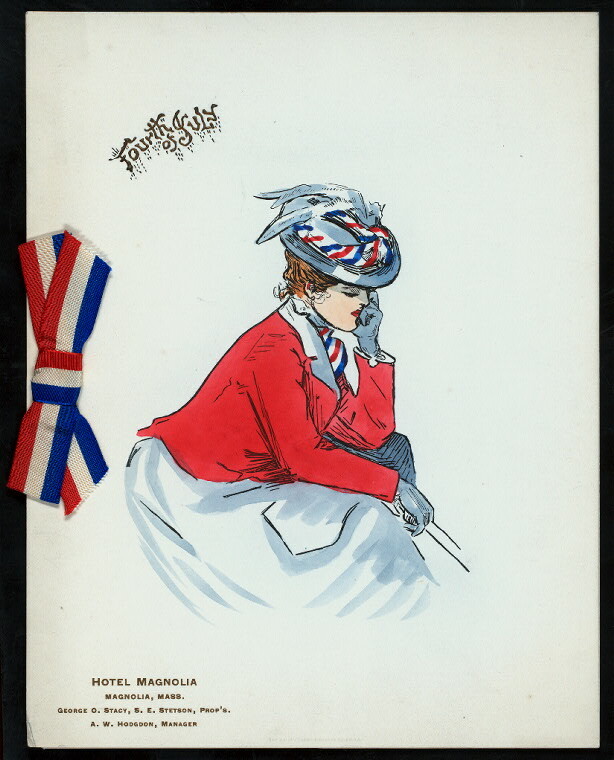 This particular Gibson Girl graces the cover of a menu for a holiday dinner held in 1900 at the Hotel Magnolia up in Gloucester, a New England coastal “clapboard castle” now sadly gone. 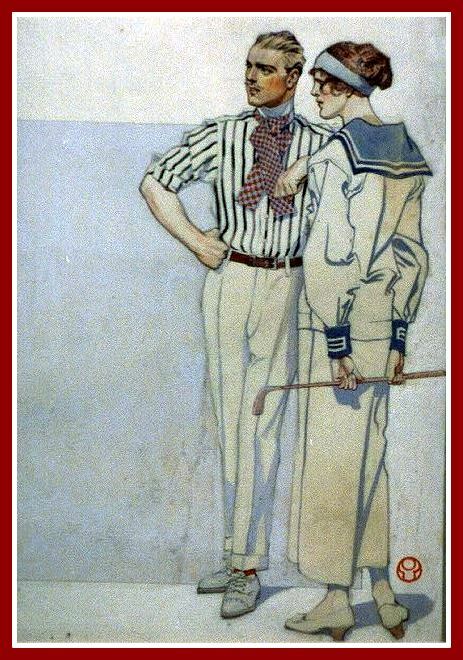 I wanted to see some more examples of July Fourth fashions from the era, so I rounded up the usual sources and found a fashionable couple and a girl from a century ago who would look perfectly fine today–especially in her gladiator sandals, very on trend this summer. 1900 Menu, New York Public Library Digital Gallery; Edward Penfield cover for Collier’s Magazine, July 1913, and “Follow the Flag” cover for Puck Magazine, July 1914, both Library of Congress. I think I’ll extend my era, backwards and forwards, to encompass more nationalistic looks. 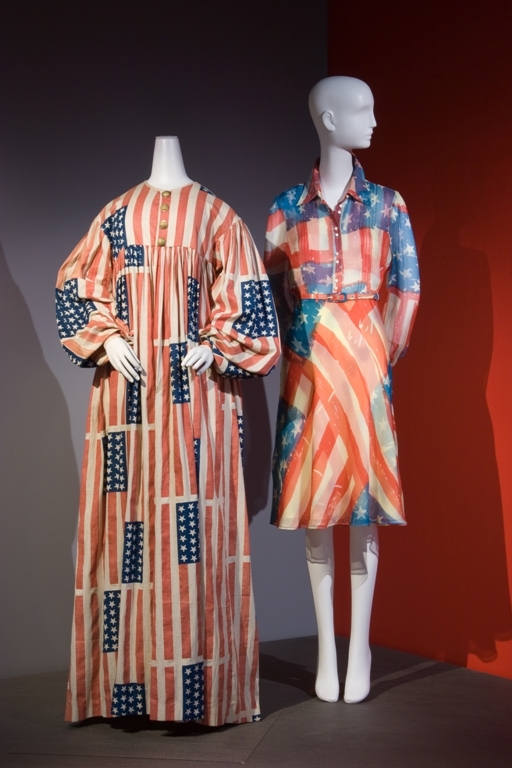 The two dresses below, separated by more than a century and featured together in the Museum at the Fashion Institute of Technology’s 2009 “Fashion & Politics” exhibition, are certainly patriotic, and perhaps a bit over the top. 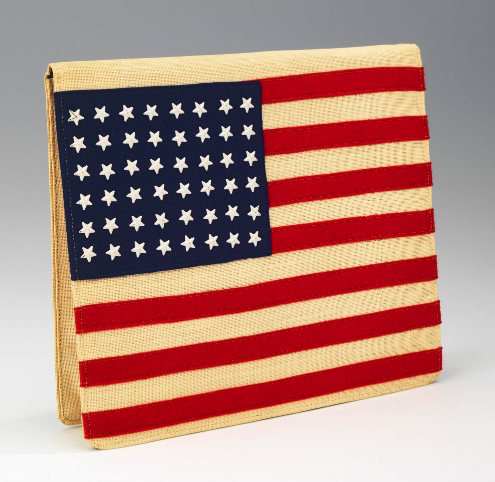 If you don’t want to wrap yourself in the flag, an accessory in red, white, and blue will do– a trend that was all the rage during World War Two. 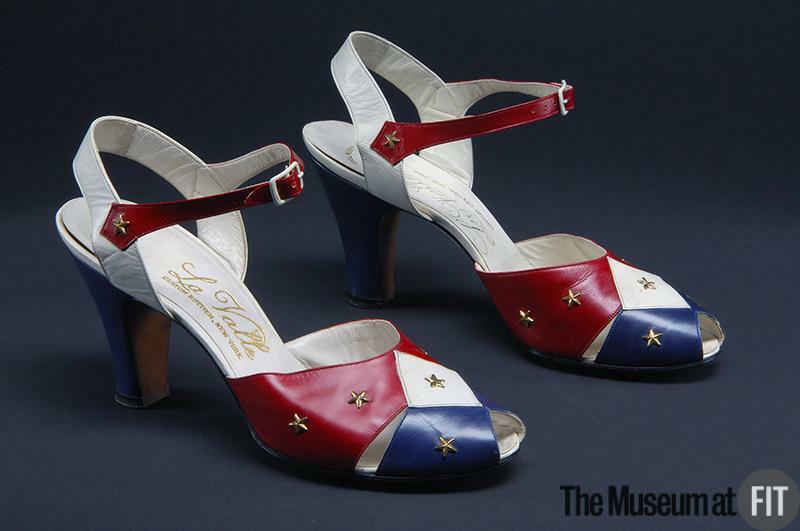 1889 costume and 2009 dress by Catherine Malandrino, Collection of the Museum at FIT, New York; LaValle Shoes, 1940, Collection of the Museum at FIT; 48-star Clutch, c. 1940-58, Metropolitan Museum of Art, New York. This entry was posted on Wednesday, July 3rd, 2013 at 6:44 am	and tagged with ephemera, Fashion, holidays, July Fourth and posted in Culture, Design, History. You can follow any responses to this entry through the RSS 2.0 feed. 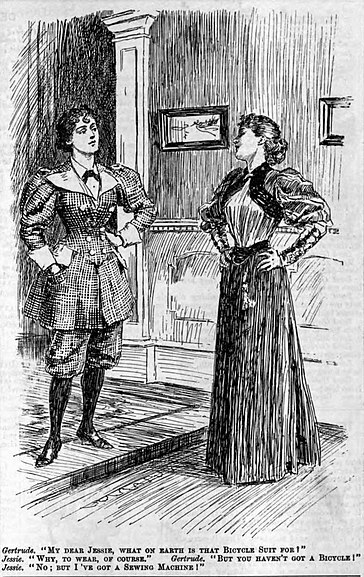 those Edwardians had somethings right!! I would have enjoyed that period I think, if I had been in the Bloomsbury group. The flag look – not so great!! thanks for another interesting and good looking article!! For me it is the Puck one that is astonishing since I believed that short dress came with WW1. Great article. Well in all honesty I think it must be a bathing costume…. Yes you must be right. 🙂 The hat (or any name you ‘d call it) show it obviously. But now, when short dresses did appear ? 🙂 If I get an answer I’ll be back with it .